We’ve been a little down and out around here the past week or so. The kids have been fighting fevers which has then translated into not sleeping well and therefore all of us stumbling through the day (or week) in a daze. As ANY parent knows, it simply isn’t fun. But, here’s the thing: I FULLY believe that fresh air helps their ability to get well faster than any amount of couch time could. They breathe better, they “clear out their systems” better, they nap better and they are a whole lot less whiney. Granted, we stay away from public parks or other kids to avoid spreading the “fun”, but playing at home in the yard (or even resting outside) is much better than indoor time with stale air. We make sure they are adequately dressed and staying warm. I did some research trying to come up with the facts about WHY kids should be outside when they were sick and really met a lot of dead ends as far as “scientific” facts. However, the general consensus (through forums and others talking about similar topics) was the knowledge that kids recover faster with fresh air. I DID find this article that points to the fact that a vitamin D (AKA sunlight…) deficiency in sick kids could actually make them sicker and this one about it being completely normal for Scandinavian kids to sleep outdoors. Both have some great points. 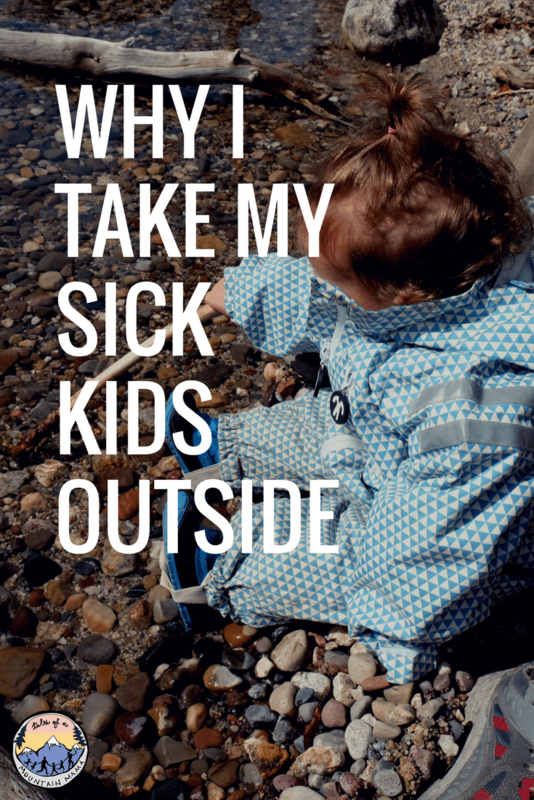 I want to know: Do you let your kids play outside when they are sick? Do you in fact make a conscious effort to increase their outdoor time because they are sick (naps in strollers, on blankets or in carriers, etc.?) Anyone have any good hard scientific evidence about why you should send them outdoors when sick to help support my case? © 2012, 2018 Tales of a Mountain Mama. All rights reserved. Republication, in part or entirety, requires a link back to this original post and permission from the author. Absolutely! I follow my children’s leads when they are sick. If they want to go outside, they definitely can. If they want to curl up on the couch and go to sleep, they absolutely can. It’s most important that we teach them to listen to their body and what it needs. It is a proven FACT that Vitamin D helps with sickness. Get out and get some sunshine! Cindy – thanks for your comment – great thoughts! And I decided to take that picture down just because I am worried people WILL try to do it (though when I was, I just didn’t know better!) 🙂 You are right – back carries with a stretchy wrap are not safe. Thanks! I find when my son is sick, often the best thing I can do is to get him outside in the Chariot or child carrier where he doesn’t have to exert himself but can still be outside and get a change of scenery. Staying at home just causes us all to go stir crazy. And we’ve been camping when he was sick. We didn’t aim to go with a sick kid but he got sick when we were there. We stayed the weekend and he still wanted to run around and do stuff – just with more breaks and down time. You guys have had some horrible camping/sick stories!! 🙂 Way to continue! And yes, we go absolutely stir crazy too!!! As much as possible! If I didn’t let him go outside that would be one of the worse thing I could do. Not only does we feel better physically but mentally and emotionally as well. We stay away from other kids/people but we’ll go for walks, play in the backyard, etc. – it all depends on how he’s feeling and what he wants to do. He picks the pace and the activity – there is definitely no encouraging to go further than he wants. Other times, I’ll bundle him into the stroller and have a good walk at mommy pace – there’s nothing like being stuck at home all day with a sick child. I agree Amelia! I take my girls outside when they are sick too (despite the looks of horror I get from my family! lol!). As you said, maybe not so much with a stomach flu type illness (we have never experienced that before, just colds) but after the fever goes away and you just have that cough and runny nose – I grab a box of tissues and we head for the trail! We stay away from other kids to avoid spreading it around but even just 20 mins outside helps us ALL feel better! Totally agree. The only time I breathe when I have cold in the winter is when I ski. One time the farther down the canyon I came, the more my voice disappeared. I am so glad I found your blog! I currently have two small children (3 1/2 and 2) who have had coughs and runny noses for almost a week. This was my first instance with this…illnesses and them old enough to be begging to go outside, my initial response was “NO..you are sick!”. But, they wanted to so badly that I started to do some research…like you, I quickly realized there isn’t any scientific info to back it up…but so many moms are saying…get out there! So, my kids are now much happier being outside and I am hoping the fresh air and sunshine do them well. Thanks again! Hi Jennifer – thanks so much for your feedback! And yes…sometimes I feel there are FEW times throughout the winter that the kids AREN’T sick, so just getting out there anyway is good for SO many reasons! Here are my thoughts on having your kids play outside versus not playing outside. What is your body doing when you are sick? Many things of course but one of them is fighting off some form of virus or infection that has found its way inside the body. If you take step outside and walk around for fresh air and that’s ALL you do then I think it is a healthy event. However, kids rarely just ‘walk’ around. What I think would be a mistake is introducing the body to yet more objects for the body to fight off when it could be in a weakened condition already. Normally I’m a big fan of kids playing in the dirt to help build up the immune system but not when that kid is already sick. Hmmm…interesting thoughts! And yes, I don’t think kids should be running around a children’s museum or something when sick, but outdoors there is just a lot less to come in contact with in regards to virus/bacteria. Not that there is NOTHING, but I am envisioning running around in the woods or even sitting in a stroller. But, I get what you are saying. Thanks so much for chiming in! Amen! I just wrote a similar post about how the only acceptable places to bring your sick kid should be the doctor or outside! Last month my four year old was home with a 103 fever. He was miserable. We spread some towels in the backyard and did puzzles in the sun, then put some deck chairs together and had a snuggle under the cozy blankets. Hooray for vitamin D and fresh air! We just started doing this bc I was reading about the stale air in our homes in the winter bc we don’t open our windows. I don’t know if it’s speeding things up but my 2 yr old enjoys getting out for our Hike it Baby hikes and walks on the trail (I carry him on my back in our Lillebaby) then before we return to the car, I let him down to run around and explore for awhile. I believe nature is healing whether it’s scientific or not. Great post and comments. Away on a vacation and my two and half year old son has been battling a cold for the last month it seems. Cough, runny nose, but that’s pretty much it. We’re out visiting Asheville, NC and decided to take him and a group out to Chimney Rock State Park. Hiked for about two hours and climber 600 steps with him. Mostly on my or my wife’s back. I’m typing this with him napping next to me and he is literally still asleep, Breathing clearly, into hour 3 of a nap. He’s normally an hour sleeper.! Mother Nature, the time outside was just what he needed. I am a believer. Nature hikes are definitely on the agenda to keep these kiddos well. I have 3 more by the way. Very old post I know but my daughter who is turning 2 on Tuesday has a runny nose, no other symptoms and I wanted to take her out to play and couldn’t find anything that deemed it ok. Then I came across your blog and decided it was time to get out and run! Thanks for this! Yesterday my 3yr old daughter woke up with a head cold. Her primary symptom was a runny nose. Last night my 10yr old daughter had a soccer game and my husband was working late, so he couldn’t take her. I said I would take her and our 3yr old could just stay in the stroller. The game was outside, 70 degree weather and partly sunny, we could not have asked for a more beautiful day. My husband said the 3yr old is sick, she needs to stay home. I said the fresh air and sunshine will do her good and I will park her away from other parents or walk her on the trail so she can rest in the stroller. This resulted in a fight. In the past I would just go along with what my husband says and my 10yr old would’ve missed her game. But after spending the last few years stuck inside all the time, seeing our kids miss so much every time one of them gets a cold, I pushed this time. This goes against my beliefs as a mother. I take good care of my kids, when they’re sick and when they’re well, and I know taking her out for some fresh air when she’s under the weather will be good for her. So I took her anyway. She had a huge smile on her face the whole time (she loves being outside) and my 10yr old played a good game – first game of the season. Lasted last night, around midnight, she developed a fever. I know this is just the natural progression of the virus she has and her being outside did not make her worse, but I expect my husband is in “I told you so” mode today. It’s very hard when parents don’t see eye to eye. I totally know what you mean. That happens to us sometimes too, but I really do strongly believe that the fresh air helps!! Hang in there, Mama! My husband just took my sick 2 yr old out in the snow. Even though she’s coughing and has a runny nose, I’m sure won’t do her more harm than good. Right?? Totally agree! My son loves being outside and I think fresh air is sometimes one of the best things you can do. Fresh air and Sun is the greatest. It doesn’t put money in any one’s pocket. That is why no one does it. I think even with a stomach bug littles get better faster if they are not inside breathing in the cleaners and sick air. It actually seams to speed up healing and make them feel better. I have 5 and one on the way and it has been my secret weapon since the first was little!! Definitely….we are just getting over it today actually and the fresh air felt SOOO good! We use the stroller to help a stuffed up baby sleep better. The moist, cool air as well as sitting upright is helpful in getting some much needed rest at naptimes. Also a mellow walk in the carrier or play in the yard I also believe is helpful as long as they are not too sick. I trust their bodies and thank to myself would it help me feel better or worse. I have made my self more sick from being too active when I should be resting. Thanks for posting this! It’s got me thinking I could be more intentional about prescribing fresh air walks.